Your creativity doesn’t fit the corporate environment. & Your ideas are completely unconventional. Am I right? I knew it! I feel the same way. Obviously, you didn’t become an entrepreneur to blend in. Being the odd one out isn’t always a bad thing, especially when it comes to starting a business and hunting down conversions. The problem that comes with starting your business, however, is that it involves writing. You know, creating all those marketing pieces from scratch. And, if you’re like most people, you absolutely dread this task. So, you want to get it over with as quickly as possible and move onto the next task on your list. Therefore, you throw together your words and end up blending in with the herd of sheep doing the same dang thing you’re doing. Did the lightbulb just turn on in that brilliant brain of yours? I bet. That’s because it’s possible for you to build a strong brand solely by finding your unique voice. Therefore, I’m here to turn you into a sheep hater so you can get to standing out from the herd and creating one-of-a-kind sales copy. First off, why even worry about finding my writing voice? That’s a really great question. After all, the last thing you need is to waste time on any tasks that won’t help expand your business. So, with the help of Distilled.net, let’s quickly walk through the importance of finding your writing voice. Expresses who you are (aka the person behind the business). When you craft materials using a boring, dry, conventional voice, it’s so much more difficult for your ideal customers to truly get a sense of who you are and what your business stands for. On the contrary, developing a unique writing voice breaks down the walls that stand between you and your potential customers developing a relationship with one another. Builds trust & inspires action. As mentioned in the book ‘Influence: The Psychology of Persuasion’, there seems to be a strong link between familiarity and trust. Developing your unique writing voice will allow your readers to feel at ease when interacting with your materials. They’ll feel they know you and your brand better than the rest, which will also help inspire them to complete your desired action (ex. Purchase, sign-up, RSVP, and so on). Makes the writing process more manageable. If you’re not writing as you speak (aka too buttoned up, which people often tend to do as soon as they glance at a blank Word document), you’re bound to find the process much more difficult. Not to mention, you’ll burn out. Finding your unique writing voice allows you to have more fun with what’s often considered to be a dreaded task! Sets you apart from the herd. There’s a lot of noise out on the Internet. As soon as you find your writing voice, you’ll illustrate to your ideal customers that you have something special to bring to the table. And, it’s communicated in a way they’ve never heard before. Convinced? Yup. I figured. Let’s dig into how you can get to uncovering your unique writing voice today. 1. Hijack your ideal customer’s mind. If it feels as if I keep repeating myself, that’s because I am! Just hear me out because this step is critical. One thing many get wrong is thinking that writing is a one-way process. You sit down, craft the perfect formula of words that best communicates what it is you need to say, edit it all, and hit publish. Do you believe that? Well, if you’re sitting, waiting, wishing for your sales to dwindle, by all means, continue with that interesting philosophy. But, if you’re ready to improve your numbers, you need to start thinking of your writing as the opportunity to have a conversation with your readers. As soon as you’re ready to hone in on your unique writing voice, the first step you should take is to hijack your ideal customer’s mind. Take your business owner hat off and really attempt to channel their questions, struggles, objections, and even how they might interact with you. When you start speaking their language—using words and phrases they appreciate—you’ll be on the fast track to creating more noticeable sales pieces. 2. Do some digging—inside & outside your industry. We all need inspiration—especially as we look to cultivate insightful ideas, decipher complex problems, and make difficult decisions. 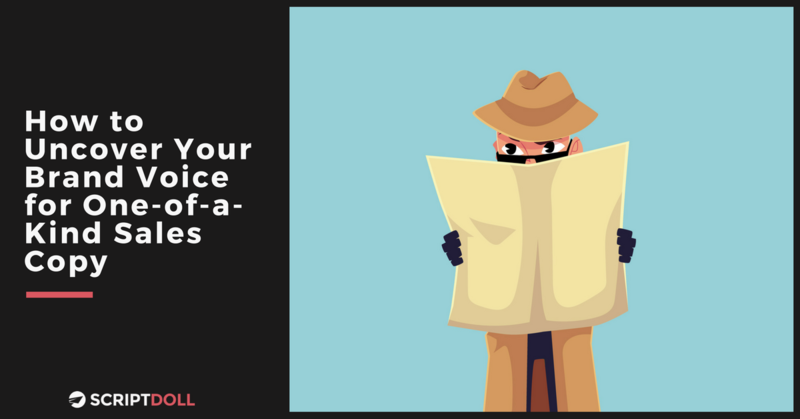 So, why not dig deep and do some research on your competitors (and even others outside of your industry) to find the right amount of inspiration you need to steer your writing voice in the right direction. And, no. I’m not saying it all needs to be puppies and rainbows. While you do want to scout out those you want to mimic (in a much better way, of course! ), you also want to chase down those you strongly dislike. Trust me, you’ll know almost immediately. For example, maybe you come across those voices that are way too formal, pessimistic, abrasive, and, oh yeah, ordinary. If those give you a gross feeling, keep searching for those that are welcoming, humble, relatable, and trusted. As a result, you’ll get a much better feel for how you aspire your writing tone to read and sound. 3. Make a list of “you-isms” that will define your voice. One thing is for sure; your list isn’t final. You can always go back and add to it. The most important thing to remember, however, is these “you-isms” will serve as your ultimate solution to stop using the same dang language as your competitors. Finally, you’ll be using your own lingo. 4. Free write & test it out. Yeah, that’s right. Free write. My goal is for you to have F-U-N with your writing. Take all that you’ve learned about what you want your voice to be and your list of “you-isms,” and go nuts. Keep trying until you shout, “HECK YES!” Once you do, it’s time to gear up to put your brand voice to the test in a real-life sales piece and evaluate the results or reactions you receive. Are people favoring your tone of voice and warming up to your content right away? Or, are they veering off the page and back out into the abyss of the Internet? If it’s the latter, it’s probably a good indicator you need to revisit your voice once more and make some necessary changes. Maybe it’s too frilly or soft for your male-dominated audience. Or, it’s not soft enough. Either way, don’t rush it. It’s a work in progress. Fun fact: This step also gives you the chance to identify where you can best showcase your writing voice in your sales pieces. Is it in the call to action? Headline? Follow-ups? Visuals? Identify the “hotspots,” so to speak, and you’ll be well on your way to not only getting noticed, but also getting heard. 5. Remember, be consistent & be proud. The last thing I want you to do is to go to all the hard work to uncover your unique writing voice only to toss it out the window a little further down the road. I have a good reason for that. If you are serious about standing out from the herd and growing a dedicated list of customers, you’re going to need to make it your mission to be consistent. And, don’t forget it throughout every single touchpoint—your sales page, email sequence, Facebook ads, and so much more. Last but not least, be proud of it. After all, it’s your differentiator to avoid falling into the dreaded trap of following the herd. After pinpointing your voice, however, you’ll need to get to creating a superior sales piece. So much goes into creating one, however. That said, to help you win big, I’m giving you a free copy of “The Copywriting Checklist That Will Make Your Offer Irresistible.” Get ready to blow your conversions out of the water! All you need to do is drop your email address into the box on the right-hand side of the page, and it’s yours! Have you taken the time to find your writing voice? If so, I want to know the benefits you experienced! Share them with me in the comments section below.